Use the Title Editor to add titles and headings to the pages of your web project. Also, because of the unique properties of a title object, you can use the Title Editor to apply skewing and rotation transformation to small quantities of text. The Title Editor dialog box allows you to insert title objects, which bear unique properties, on your page. Font Select from the drop-down menu a font to apply to the title. The menu contains all available fonts on your system. Size Enter or select from the drop-down menu a point size for the specified font. Do not attempt to enter a value larger than 72, or the system may crash. Bold Click to checkmark to apply a boldface effect to the title. Italic Click to checkmark to italicize the title. Underline Click to checkmark to underline the title. Color Opens the Color dialog box that allows you to select a system or custom color to apply to the title. Click and drag to use the color dropper tool to pick up a color anywhere on your computer screen. Release the mouse button, and the control will display the selected color. The title object will then bear the selected color. 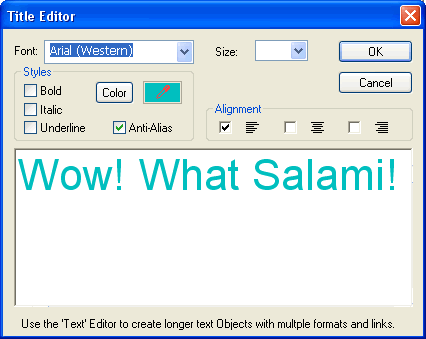 If title text is the same color as the page background, the Title Editor background color is adjusted so that the text is visible in it. Anti-Alias Click to checkmark to smooth the jagged edges of the title object. Left Justified Click to checkmark to left justify the title. Centered Click to checkmark to center the title. Right Justified Click to checkmark to right justify the title.